Snow, snow… but I live in Southern California now! Okay, okay so it didn't snow on race day but it snowed in Denver the day before the race so I got a little worried. Luckily race day held up just fine, a little chilly but still fine. I was in Denver for the Insulindependence Regional Event. People with diabetes from across the Rocky Mountain region all got together to volunteer at the aid station on mile 20 of the marathon course, to attend a few events throughout the weekend and to enjoy the race. While at the event I decided to race in the half-marathon, only two weeks after doing the Half-Ironman and two weeks prior to another one. Over the weekend my blood sugars were running a little high, mainly from what I learned was a bad infusion site in the days before the race. Not even following my own preaching I wasn't using long acting insulin and suffering from a bad pump site with high blood sugars. Finally taking the site out on Saturday afternoon I was able to stabilize the sugars, use long acting insulin and get my blood sugars to a good point for the race. Race morning I bloused a little high which I would later pay for with lows during race. Running the half-marathon I ate over seven GU Gels, equaling about 175 grams of carb total. It must have done something right though because I felt good during the race. 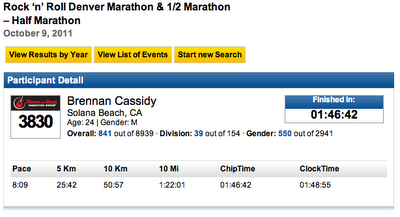 Despite the altitude, I was able to hold the exact pace I wanted to (goal race pace 8:10, pace ended averaging 8:09). The first half of the race was rough, getting some of the kinks out from the Half-Ironman still but the second half felt great. 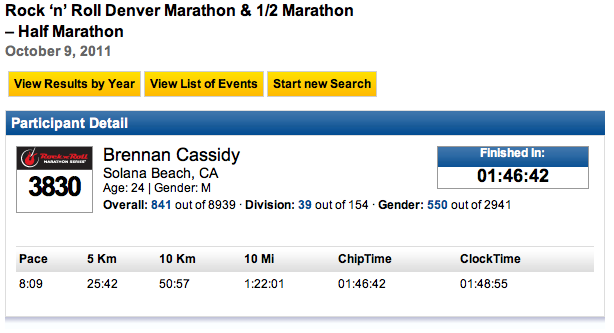 I ended with a time of 1:46:42, proving I'm in much better running shape than I was during the January Carlsbad Half. Only being about a minute slower despite the race being hilly, at altitude, being sore from the half-ironman and slightly dehydrated from the high blood sugars.